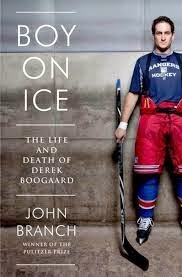 Boy On Ice by John Branch is a solid book that was written out of a lengthy three-part series on the late NHL player Derek Boogaard that Branch wrote for the New York Times. The magazine series and then book show how the pressure is bad enough in someone trying to become a professional player, but seems to take it to a whole new level when they're early on put onto the track of being a hockey enforcer. They've got one role as a fighter all the time, don't know when they’re going to do it, aren't directly getting points that lead to winning and losing and can suffer repeated concussion head trauma through the process of it, along with normal injury risk that other skaters take. Related to this idea of the hockey enforcer as a specific subset of players different than the rest, I found interesting how in reading of Derek’s minor hockey career, the same names of fighters kept popping back up, and they were often people who I recall then going on to play in the NHL as he did. Branch split the book into thirds, with the first part about Derek growing up and then playing minor hockey, the second on his time as an NHL player in Minnesota and third his brief time as a New York Ranger prior to his death. Derek grew up in Saskatchewan and it’s covered in the book how it was challenging growing up the son of the local Royal Canadian Mounted Police representative, never staying one place long, as well as being a bigger hockey player than others. Derek played top level youth hockey due to his size, 6'4" and 210 pounds at 15, but wasn't a great skater or player and other parents would complain about him. At the age of 15, Derek had an incident playing youth hockey where he fought someone, then went into the penalty box of the opposing team and sent them scattering. From this, he was invited to the training camp of the Regina Pats Western Hockey League team and then at 17 was traded to a team in Prince George, British Columbia. Again, it’s got to be tough for any kid to make that kind of move away from family at such a young age and seems particularly hard for someone like Derek who was playing in the leagues he was simply for his ability to be the team enforcer. When Derek was 19, he was drafted in the seventh round by the Minnesota Wild, went to training camp with the Wild in 2001, then was sent back to Prince George and subsequently traded to a team in Medicine Hat, Alberta. Twenty year old Derek then wound up playing with the Louisiana Ice Gators, an East Coast Hockey league affiliate of the Wild and at 21, Derek was sent to the Wild's American Hockey League affiliate Houston Aeros, with the Wild sending instructions to Aeros coaches Todd McLellan and Matt Shaw that Derek was to be groomed as the future enforcer for the Wild. In Houston, Derek began to get injuries and was first prescribed pain relievers, then after two seasons in Houston made the Wild roster out of training camp in 2005. Derek instantly became a popular player in Minnesota, both because of his fighting and how he was a mild-mannered and nice kid. At the same time that he was having success on the ice, again as an enforcer who played little and fought regularly taking and receiving blows, his body started to betray him and he began being prescribed by Wild team doctors lots of drugs, ranging from Ambien for sleep and Toradol, Oxycodone and Hydrocodone pills for pain. Additionally, Derek supplemented his readily available supply of drugs he was getting from team doctors with illegal sources for pain medications. People began to see changes in Derek’s personality with him becoming more sullen and withdrawn and an additional interesting note that Branch made about Derek’s time with the Wild was how even as he was loved in the community, he as an enforcer was treated differently than other players, he was the one fans wanted to have a picture taken where he pretended to punch them. Derek in 2009 was put in the NHL/NHLPA substance abuse program and after that he didn't get team doctor prescriptions for some painkillers, but still got prescribed lots of other drugs. Really, the amount of drugs that team doctors would prescribe him in the NHL, both before and then while he was actually in the NHL/NHLPA drug treatment program, was astounding. After the 2009-2010 season Derek was a free agent and signed with the New York Rangers. Following an injury he suffered from a December 9, 2010 fight with Matt Carkner, Derek poured himself into his use of Ambien and pain medications, now heavily supplemented by a local illegal source for OxyContin. Derek for the rest of the 2010-2011 season was injured, not part of the team, lonely, depressed and addicted to painkillers. Additionally, his behavior was becoming increasingly erratic, likely exacerbated by the mix of toxins going into his body and the abuse it had taken over the years. The Rangers sent Derek back to rehab in April 2011, but he appeared to have different rules than everyone else, coming and going as he pleased and was back in Minneapolis in May with team approval to go there for physical therapy. During that trip he overdosed on painkillers and alcohol, double the legal alcohol limit for driving, and died. After his death, Derek’s parents gave permission to have his brain examined for CTE, a degenerative brain disease that can only be diagnosed posthumously and is caused by repeated blows to the head. Examination of his brain showed stage two (of four) CTE, more severe than the doctor looking at his brain had ever seen in a 28 year old. While doctors couldn't say for sure what led to Derek's behavior, manifestations of the disease are memory loss, impulsiveness, mood swings, disorientation and addiction and Branch notes that Derek may well have had dementia in his 30's had he lived. The idea of the hockey enforcer could be seen as culpable, but more specifically, the role of team doctors and the NHL/NHLPA drug treatment program seems to bear examining. The amount of drugs Derek was prescribed was astounding, as was how he abused legally and illegally obtained drugs throughout his time in the treatment program. As a result of this Derek’s family in 2013 filed a wrongful death lawsuit against the NHL. His story is a sad one on many levels and in both the book and shorter New York Times series, Branch tells it very well.